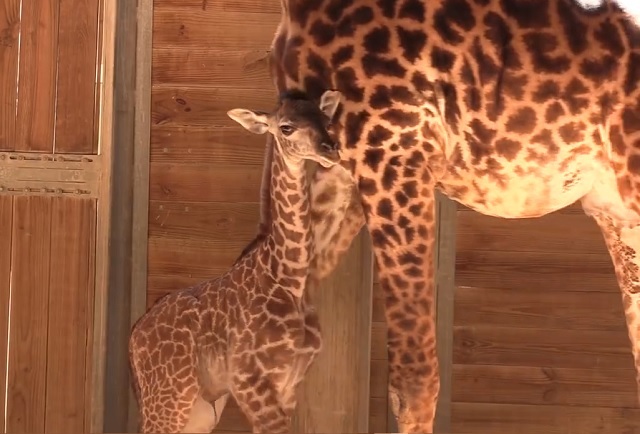 MELBOURNE, Florida -- The Brevard Zoo welcomed another baby giraffe this week. The male Masai giraffe calf stands at 6’4” and is the tallest giraffe ever born at the Zoo. Zoo officials say that the baby boy giraffe and his mom, Millena, stay behind the scenes for a few weeks before joining the rest of the herd in Expedition Africa. Giraffe have no formal breeding seasons and calving is often synchronized to provide safety in numbers against predators. The average gestation period for giraffe is approximately 15 months or 453 to 464 days. Millena gave birth to a baby girl giraffe 25 months ago in February 2013. Giraffe give birth standing up, requiring the newborn to fall about six feet to the ground. A newborn calf can stand up and run within an hour of being born. The average height at birth is around six feet and females tend to be slightly smaller than the males. Newborn calves grow very quickly and can nearly double their height in the first year. A newborn giraffe will suckle its mother’s milk as soon as it can stand up. Calves are reliant on their mother’s milk for nine to 12 months. Generally, there are three types of giraffe species in zoological facilities. They are commonly referred to as Reticulated, Rothschild and Masai. The Masai species has historically represented a smaller population in zoos. The Masai giraffe has jagged spots on its body and the dominant male’s spots tend to be darker in color than those of other members of the herd. Adult Masai giraffe males can reach a height of more than 19 feet; females tend to be a bit shorter. An adult giraffe heart can weigh up to 25 pounds. Both male (bulls) and female (cows) giraffe can live to about 25 years in the wild and longer in captivity.